The only way to stop an attack for your pet goose -- besides avoiding such encounters in the first place -- is to leave the area. You want to project confidence while retreating, but do not act aggressively. With luck, your pet will realize that you are not a threat and will leave you alone. Canadian geese (Branta canadensis) are normally gentle creatures who cause few problems aside from their copious droppings. However, during the breeding season, which usually takes place in April or May, your beloved pets are likely to become protective of their nesting areas. While females sit on the nests, incubating their eggs, their mates patrol the surrounding area, guarding against potential threats. Venture too close to the nest, and the sentry will begin hissing, extending his wings and walking toward the intruder. If you fail to heed these warnings, the geese will unleash a barrage of pecks, wing flaps and shrieks. 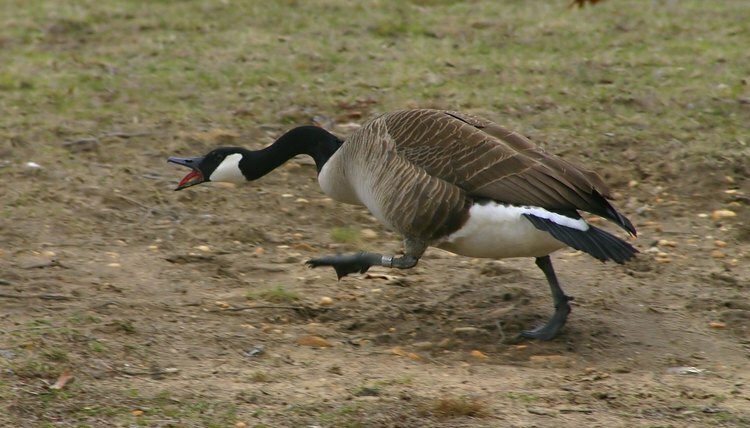 Because geese who attack once often become more aggressive, you should try to avoid contact. Try to determine exactly where the nest is located, and keep clear from the area. While the idea of being attacked by your pet goose may seem humorous, geese and their relatives are large birds that can cause serious injuries. In 2012, the Chicago Sun-Times reported that a swan (Cygnus sp.) caused an Illinois man to drown. While geese are smaller than most swans, they are more likely to attack perceived threats. Geese have excellent vision and are quite adept at reading body language. When confronted with an angry goose or gander, make strong eye contact. This will demonstrate that you are not an easy target, and may convince the bird to keep his or her distance. Keep your shoulders square with the geese, and slowly back away, using your peripheral vision to avoid obstacles. The goal is to remove yourself from your bird’s nesting area, at which point the attack will cease. While you do not want to cower or appear submissive in any way, refrain from hitting, kicking or otherwise striking the bird. Doing so likely will increase the severity of the attack and may cause the female to leave her nest and join her mate, effectively doubling your problem. While you should cover your face and duck if the bird takes flight, do not obscure your vision while the goose remains on the ground. If you must move out of the way, move perpendicularly to the bird’s path.